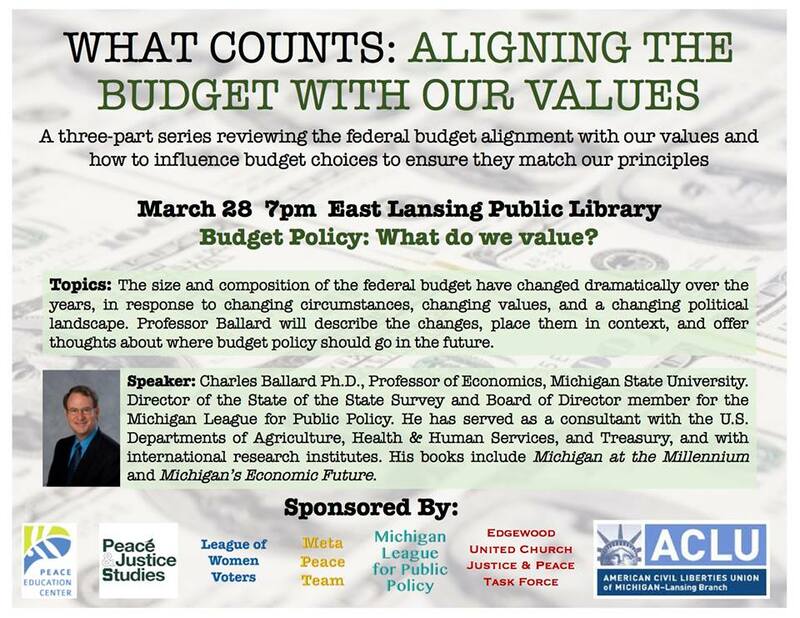 Professor Charles Ballard, MSU Economics, will provide an overview of the federal budget including trends, revenue streams and expenditures. This is the first of a series of PEC-sponsored talks on the federal budget process. The idea is to bring the public’s attention to the budget process and to examine how we spend our money and how changes affect how we live. The series is sponsored by Peace Education Center, Edgewood United Church Justice & Peace Task Force, League of Women Voters, Meta Peace Team, Michigan League for Public Policy, ACLU, and MSU Peace & Justice Studies. May 8, 2017 – 7pm: Prof. Emeritus Tom Weisskopf, U-M Economics, “Does the U.S. Spend Too Much on Defense?” – a look at the cost, impacts, and alternatives to military spending. In April we hope to have Jim Cason, Legislative Director for Foreign Policy at Friends Committee on National Legislation, talk about military spending, the alternatives, and how citizens can impact budget choices.